Roseville Self Storage at 540 6th St. 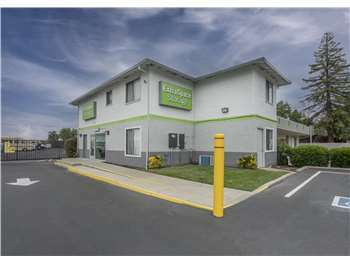 Located at the corner of 6th St. and Vernon St., Extra Space Storage serves Roseville residents near Theiles Manor, Hilltop Circle, Hillcrest, Imran Woods, Folsom Road, Antelope Woods, Westwood Park, Colonial Acres, and Meadow Oaks. Locals will recognize our facility just west of Mark White Neighborhood Park and Kingdom Hall of Jehovah's Witnesses near Sierra Plant Rental & Display. We're also accessible for residents of nearby apartments, such as Windscape Apartments, Cirby Woods Apartments, Cirby Oaks Apartments, West Wind Apartments, Vineyard Gate Apartments, Somersett Hills, and Sierra Regency. Extra Space Storage on 6th St. has a variety of storage unit sizes and amenities, including vehicle storage and exceptional security. We're the self storage solution you're looking for in Roseville! With storage units ranging in size from 5x5 to 9x49, our 6th St. storage facility can handle a wide range of storage needs. We also offer indoor access, first-floor access, drive-up access, and outdoor vehicle storage. Need secure vehicle storage in Roseville? Extra Space Storage offers 9x24 to 9x49 outdoor parking spaces and 10x10 to 10x30 drive-up units that can accommodate cars, motorcycles, boats, and RVs. At Extra Space Storage, we're committed to providing secure storage. Our Roseville storage facility utilizes advanced security measures, such as electronic gate access with personalized entry codes, 24-hour video surveillance, and an on-site resident manager, to protect customers and their belongings. Extra Space Storage wants you to have an excellent self storage rental experience. With a friendly, professional staff and a clean, secure facility, we'll go above and beyond to meet your needs. Contact us today to reserve a storage unit in Roseville! My experience with renting from Extra Space storage has been very good! All the employees I've dealt with have been extremely helpful and friendly! Eric the manager onsite provided excellent customer service! He was kind and professional. The site was clean and well kept up. I felt safe and comfortable leaving my property. Great affordable with promotion and great customer service! They had the exact size spot I was looking for. The staff was great to work with. The location and space was perfect for me as well as the pricing. The employees were very pleasant and helpful. I would definitely recommend this storage facility. I haven't had any issues. Extra space storage has been a great experience. Very clean facility and excellent customer service. All issue and questions have been met with sincere effort to satisfy my needs promptly. Very reasonably priced; it's an excellent value. Set up reservation online, dont know why because it is apparently first-come-first-served so that makes no sense at all. Manager calls and tells me all of this but if it gets rented she'll call me. Didnt get a call, unit got rented out. So we went with the bigger storage unit and was told when we were renting that they would be closed JUNE 29TH for paving. Show up on June 28th to store some stuff since we're moving, theyre closed for paving. Call on 29th which was the day they said they were closed and they're open, but they're going to be closed again on the 30th. We have to move out by the 1st and i am absolutely furious this wasn't notified to me since they have all my contact information including email address and phone number. Never doing business again. I DO NOT HAVE ANYTHING BAD TO SAY, THEY WERE HELPFUL, UNDERSTANDING (THE WORKED WITH ME) TO MEET MY NEEDS. VERY CLEAN AND ALSO HAVE FREE 1ST MONTH. We needed to store our RV. Extra space had a spot right away and for a reasonable price. The parking lot is gated and monitored by cameras. It's just right for our RV. I found extra storage space online. When I went to te facility the manager was very helpful in finding me the right size unit for my belongings. They were knowledgable and the whole process only took 15 minutes and I was done!! The manager and staff are very helpful. They take pride in their work. I came back to extra space it is clean the people working there always are smiling and helpful,other storage renters are nice too. Love the location of this facility. Good customer service, but the rate hikes are frequent and rediculous. I feel like there may not be enough tenants, so those of us who do have units are paying extra to make up for the empty units. Also, there is a Yellow Jacket problem. I was stung in the face when trying to access my drive-up unit. I reported the incident but have not been back since. I hope they have addressed the problem and got someone out there to get rid of the nests. I like this location for it's easy access, but I have not seen security cameras though. Chose this facility for their amazing price. Used to be worth the drive from Rocklin to Roseville. Now they are the same price as the place 2 blocks away. Two price hikes in 14 months. Guess they don't like long term tenants. You can go online now and get a unit for less than I'm paying before the second price hike. Online 'Reserve Option" says "Lock in your price!" I wish that was true. We are located on the corner of 6th and Vernon, right near downtown. South West I-80 to exit 102 Riverside Ave- exit will merge onto Riverside Ave- proceed North for 0.2 miles- head West and turn left on Cirby Way - An AM/PM gas station is on the corner of Riverside and Cirby and a car dealership is on the opposite corner- Drive for 0.5 miles- heading North - next; turn right on Vernon St; shopping plaza is on the corner of Cirby and Vernon Streets - drive for 0.4 miles - train tracks are on the left and you will make a right on 6th St. We are located on the corner of 6th and Vernon. North East I-80 to exit 102 Riverside Ave- exit will merge onto Riverside Ave- proceed North for 0.2 miles- head West and turn left on Cirby Way - An AM/PM gas station is on the corner of Riverside and Cirby and a car dealership is on the opposite corner; proceed North for 0.2 miles- head West and turn left on Cirby Way - heading North - next; turn right on Vernon St; shopping plaza is on the corner of Cirby and Vernon Streets - drive for 0.4 miles - train tracks are on the left and you will make a right on 6th St.
Head West on Cirby Way- plaza will be on your right hand side on corner of Cirby and Vernon- A church is on your left- next; turn right onto Vernon and head North on Vernon St for 0.4 miles- Railroad tracks is on your left and we are located on the right at the corner of 6th street and Vernon street. Head East on Cirby Way from Foothills BLVD - plaza is on the left - and a church is located on the right hand side -you will turn left onto Vernon heading North on Vernon St for 0.4 miles- train tracks will be on your left and we are located on the right -- on the corner of 6th and Vernon.